A thoughtfully designed space, specifically created with exotic touches, to refresh tired minds and bodies – from the weary traveller to the weekend escapee – for business, pleasure or both. Discreet accommodation, tucked away at the end of your personal, private, tree lined driveway and set in an acre of private gardens with native bird life to stroll at your leisure, Quince Lodge is a perfect getaway location. With every comfort provided for; from an artisan breakfast menu, king size bed with Egyptian cotton sheets and indulgent bedding, complimentary WIFI, 50” Flat screen TV, Blu-ray and DVD’s (with a choice of over 500 movies and TV series from our personal collection for your use), Nespresso Machine and coffee pods. Generously equipped full kitchen, laundry facilities, Heritage Bath and Shower with organic toiletries and fluffy towels. We use quality local products where available, organic cleaners and allergen free, organic cotton bedding. We also offer a grocery order service (you pre order and we will pick up and unpack for the day of your stay) ...... we’re confident we’ve thought of everything to ensure your convenience and comfort during your visit and if any assistance is required we’re always on hand to help. Patea is located on the West coast of the North Island and is the southern gateway to the stunning award winning province of Taranaki (voted 2nd best region in the world to visit – Lonely Planet 2017), served by two domestic airports, Whanganui and New Plymouth, both around an hour away. 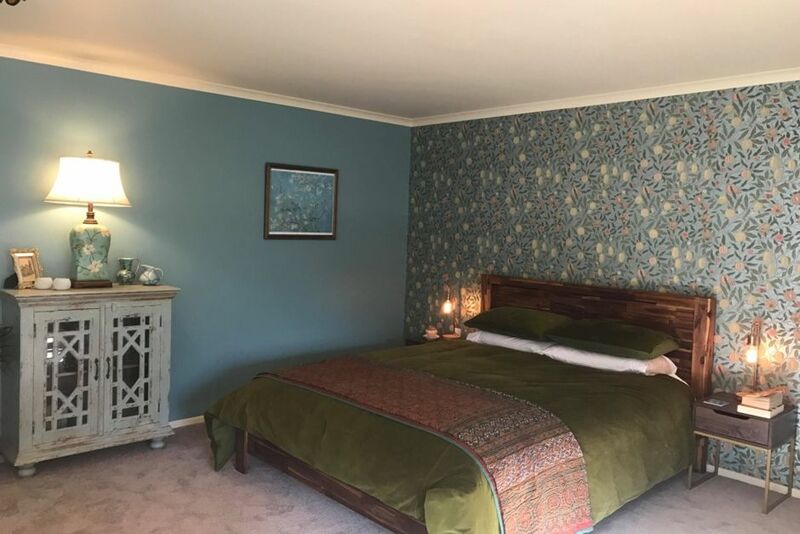 Quince Lodge is ideally located as a stopover point if travelling along the west coast between Auckland and Wellington. Easy drive to Egmont National Park, Dawson Falls, Cape Egmont, Stratford Plateau. Apologies guests - we can only accommodate 2 people until early July. The most amazing little gem with ALL the trimmings! We are so happy we stayed here. It was immaculately clean and every item looked carefully choosen for this accomodation . We had a 2 year old and he loved the grounds, riding his bike through all the different gardens, feeding the fish and watching the chooks. We felt very spoilt with choclates in the fridge, home baked muffins and the luxury of pod coffees. The breakfast was to die for! 1000/10! ive never had a breakfast like it, yummm!!!! Just fantastic! Beautiful cottage, luxurious and cosy! Great bathroom with a bath! A brand new kitchen with all you need and more. The breakfast was the best. Better than you will ever have anywhere!